Mayor Rahm Emanuel (r.) presents Forrest Claypool (l.) as the new CPS chief executive officer, with David Vitale being replaced by Frank Clark as head of the Board of Education. EAST GARFIELD PARK — The mayor overhauled Chicago Public Schools' leadership team Thursday, tapping his chief of staff, Forrest Claypool, to serve as chief executive officer, and also naming Frank Clark to replace David Vitale as head of the Board of Education. 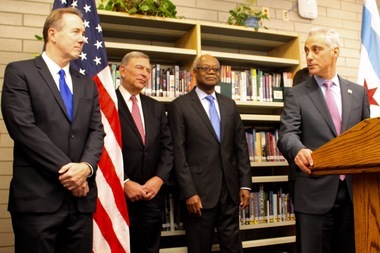 In a news conference at Westinghouse College Prep, Mayor Rahm Emanuel acknowledged the shift of Claypool would "disrupt my own office," but called the longtime political trouble-shooter "exactly the right person at the right time to lead CPS." Claypool cited the "enormous progress academically" made at CPS over the last four years, including imposing a full day of school and full-day kindergarten districtwide, as well as seeing test scores and graduation rates rise, but added that "these gains are at risk" with the $1.1 billion budget deficit faced by the district. Board of Education President David Vitale (l.) is stepping down to be replaced by Frank Clark. Claypool echoed remarks made by Emanuel that CPS was being "whipsawed" by state funding cuts while being charged to make long-overdue pension payments by the General Assembly. He called on state legislators to grant CPS $500 million in relief to help balance its budget. Claypool called running CPS the "single most challenging" task he's been assigned in his political career, but added, "nothing's more important than kids." Claypool served as president of the CTA during Emanuel's first term before returning, however briefly, to City Hall. He replaces former CPS CEO Barbara Byrd-Bennett, who announced in April that she would take a leave of absence from the position. She said that a federal grand jury investigation into a $20 million no-bid contract awarded to a firm she previously worked for would "impact on her ability" to lead the district. In the interim, Board of Education Vice President Jesse Ruiz has been at the helm of the nation's third-largest school system. Emanuel said he was holding to a promise to place Ruiz in the post for only three months while searching for a replacement for Byrd-Bennett. Ruiz will now return to his previous post on the board. Emanuel named Claypool his chief of staff in April. Claypool previously served two terms as chief of staff to Emanuel's predecessor, Mayor Richard M. Daley, and headed the Chicago Park District in the 1990s. He served on the Cook County Board in the 2000s and ran unsuccessfully for board president and, later, as an independent against Joe Berrios for assessor in 2010 before being tabbed to head the CTA by Emanuel four years ago. "I've known Forrest Claypool for 35 years. He has an unparalleled record of reform, accountability and leadership in city and county government," Emanuel said in late April. "That's why one of the first calls I made during my transition in 2011 was to Forrest to ask him to lead the CTA. He is a world-class manager, and under him the CTA has never been run better." The Chicago Teachers Union, however, did not embrace the move. "Claypool is a political 'fixer' and longtime mayoral insider who represents another non-education, business-style manager of our schools," said CTU Vice President Jesse Sharkey. "Mayoral control has given us 20 years of businessmen running our schools, going back to Paul Vallas, and look where it’s gotten us. This appointment suggests that the mayor will look to cut even more from neighborhood schools, when what we need is a return to an education-centered approach to our schools." On that note, Sharkey also dismissed the appointment of Clark as president of the Board of Education, replacing Vitale, calling it "merely swapping one businessman for another" and pointing to his role as chairman of the commission that went along with the closing of Chicago public schools two years ago. “The CTU is negotiating a contract with the board and is willing to work with anyone, but these political appointments are telling us a lot about where the mayor is taking our schools, which is over a cliff,” Sharkey added. “The need for a new CEO and board president because of corruption and irresponsible financial practices are clear examples of why we need an elected, representative school board." Claypool, however, said he had already been in touch with CTU President Karen Lewis and planned to meet with her as soon as possible. He called on the teachers' union to serve as "our partners in Springfield" in lobbying for additional funding and reforms, adding, "We have a common interest." 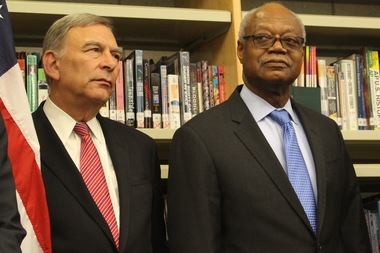 Clark replaces Vitale, who came under criticism for engaging the district in what's been called "toxic loan swaps" with banks that led to increased interest rates, as well as for rubber-stamping the no-bid contract that prompted a federal investigation into Byrd-Bennett's dealings at CPS, and, of course, presiding over the 50 school closings two years ago. Clark rose to chief executive officer of ComEd at the end of a 40-year career at the utility. He also helped found the Rowe-Clark Math and Science Academy, a charter school on the West Side. Yet he insisted Thursday that does not reflect a preference for charters, and expressed optimism CPS could solve its financial problems, saying, "The task before us, while difficult, is not unachievable." Emanuel also named Janice Jackson CPS chief education officer. Jackson was the Westinghouse principal when it made the transition to a college prep school. Emanuel insisted it was Vitale who approached him to step down as School Board president. He said that, in naming Clark as well as Claypool and Jackson to the posts, he was taking a "team" approach to giving CPS a "new start." Both Clark and Jackson are CPS products, with Clark having graduated from Hirsch High School and Jackson from Hyde Park High School, both on the South Side.